Vienna in January doesn’t get a lot of love. 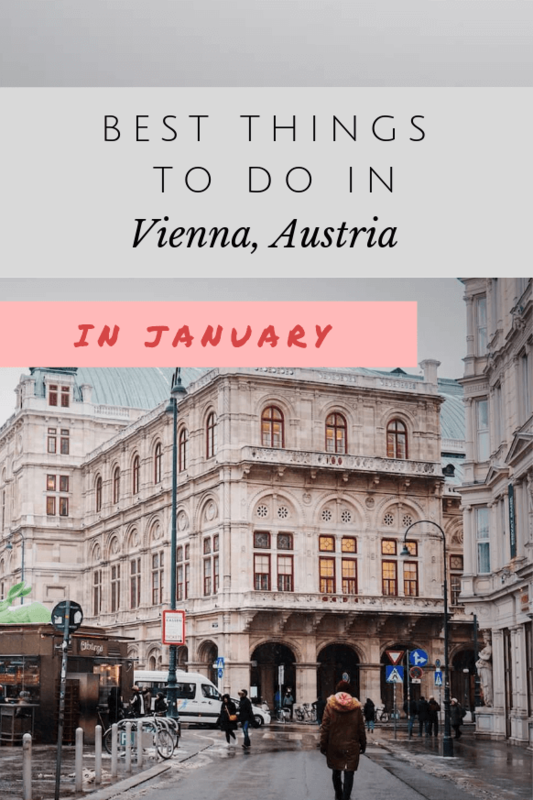 Most blogs about winter travel in Vienna focus on the Christmas season and the famous Christmas markets. We love the seasonal markets too, but if you’re arriving in January or February, Christmas festivities aren’t relevant. 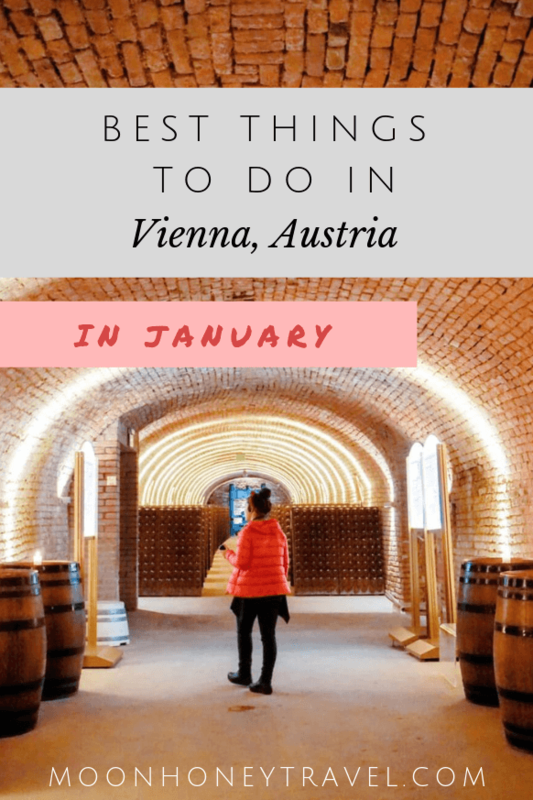 So, we wanted to write a post about the most unique things to do in Vienna in January, so you can plan an unforgettable winter trip. 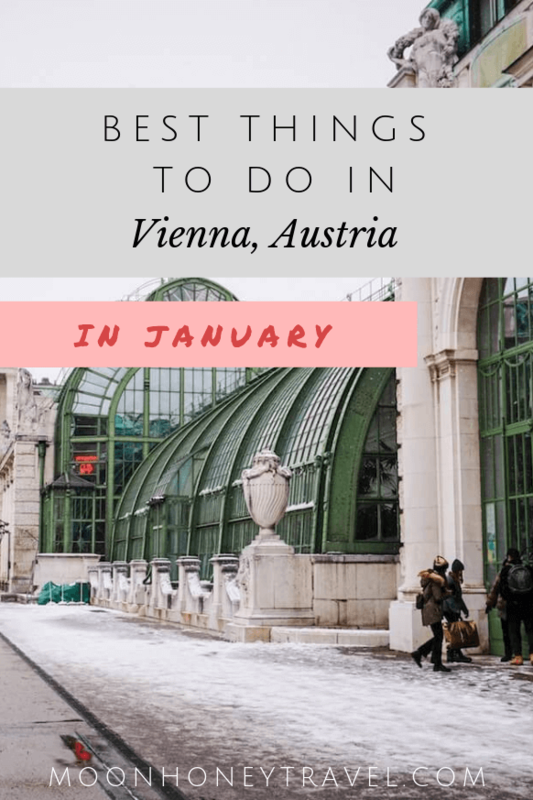 Also check out our Vienna City Guide to find out where to stay, what to experience, and where to eat. Vienna can get pretty frosty in January. Expect the daytime temperature to hover around -1°C, or 0°C. The highest temperature we experienced was 4°C. Light snowfall is common, but it rarely lingers more than a day. It’s essential to have warm boots, a winter jacket, hat, and scarf. And while you’re there, connect with us on Pinterest! And, Instagram too! 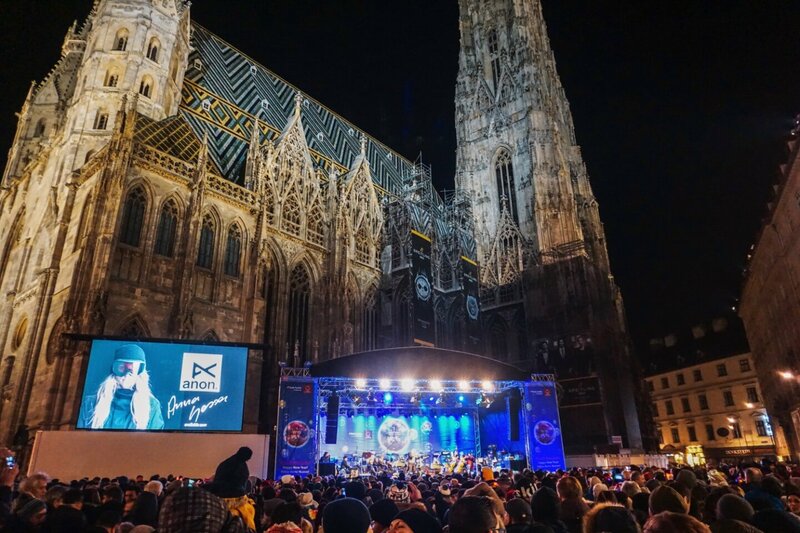 Are you planning on visiting Vienna for New Years? If so, you’re in luck. Each year, Vienna’s first district transforms into a huge street party. On New Year’s Eve, you can spend hours following the Silvesterpfad (New Year’s Eve Trail) through Vienna’s inner district. The path guides you to different stages featuring different types of live music. Along the path, there are food stalls selling mulled wine, champagne, and non-alcoholic beverages. Admission: The event is free. You don’t need to purchase any tickets or make reservations to attend. Count Down: No matter where you are, Strauss’ Blue Danube is played when the clock strikes midnight (24 Uhr). And in true Viennese style, everyone dances the waltz into the New Year. For the best view of the fireworks, head to the Rathaus. Start Time: The New Year’s Eve trail begins at 2:00 p.m.
End Time: The New Year’s Eve trail ends at 2:00 a.m.
It’s a Viennese tradition to see Johann Strauss II’ Die Fledermaus around New Years. Both the Vienna State Opera and the Vienna Volksoper stage the famous Viennese operetta each year in late December and January. It’s fun, joyous, and absolutely enchanting. So, if you’re new to opera, this is the perfect place to begin. In an operetta, the dialogue is spoken, not sung. Tickets: Buy your tickets as soon as possible. 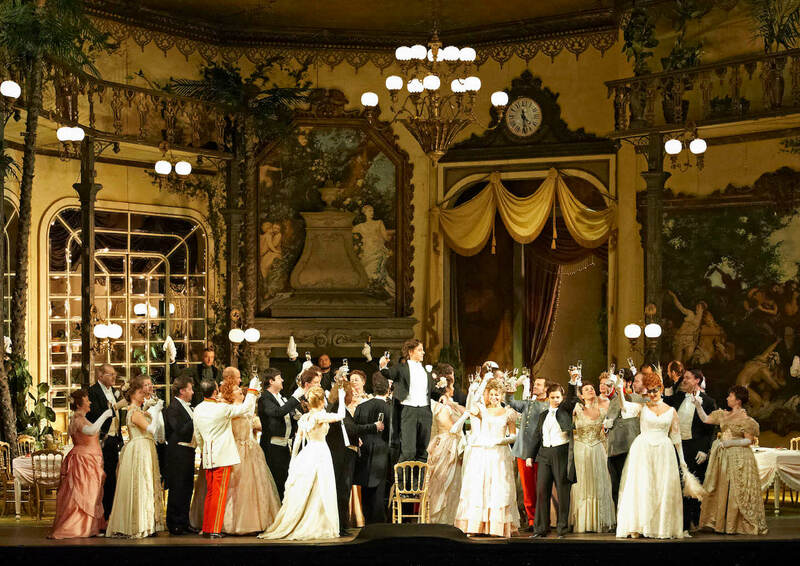 Die Fledermaus will likely sell out quickly for performances in early January. If tickets are sold out for the Vienna State Opera, you could also get a standing room ticket. 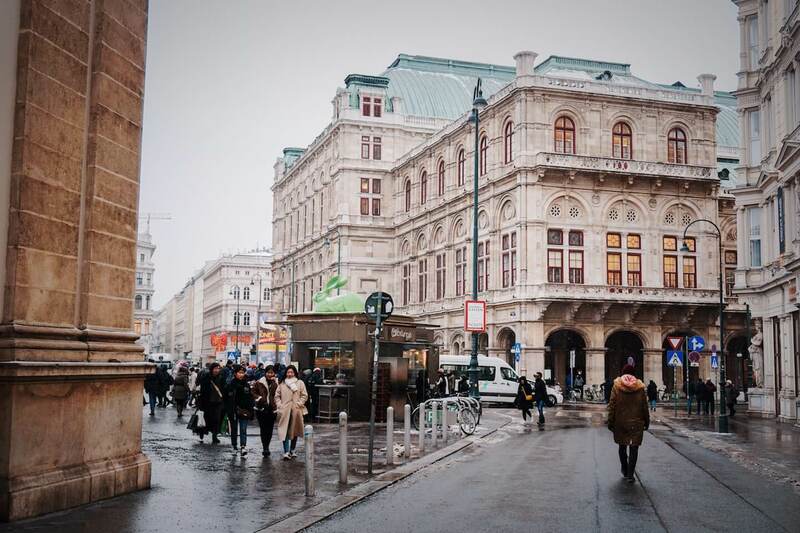 Read Next: How to Get Standing Tickets for the Vienna State Opera. The performance of Die Fledermaus will be excellent at both opera houses in Vienna. However, there’s one thing to consider. Since the Die Fledermaus libretto is in German, you will need subtitles. At the Vienna State Opera, every seat has a personal screen for subtitles. So, you’ll know exactly what’s going on during the whole performance. However, at the Vienna Volskoper, subtitles aren’t always a given. If you check the Vienna Volskoper schedule (“Spielplan” in German), you’ll know which performances have subtitles and which do not. Below the performance name and the composer, it’ll either say in German language with English subtitles or just in German language. 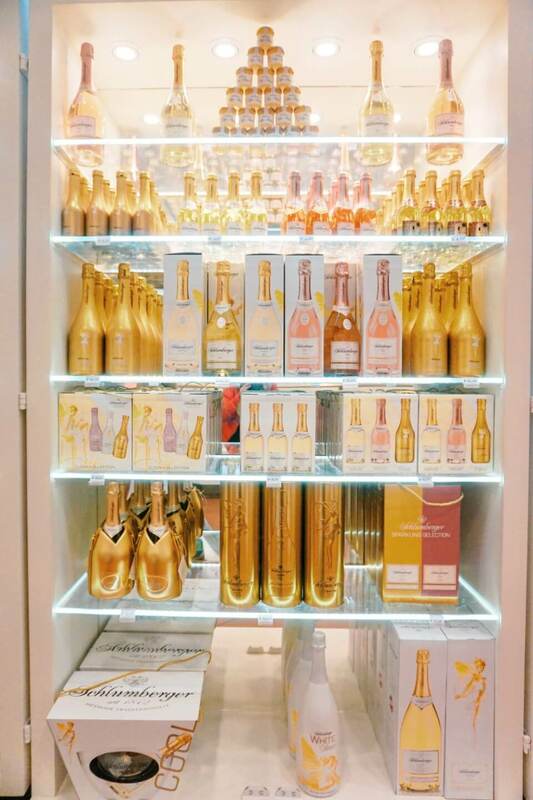 Did you kick off the New Year with a bottle of champagne? I certainly hope so. If you want to infuse your champagne drinking with extra knowledge, then head to Schlumberger Cellar World. After touring the 300-year old sparkling wine cellars, you’ll have a sound understanding of how champagne is made and can casually toss around terms like cuvée, tirage, riddling, dégorgement and dosage. 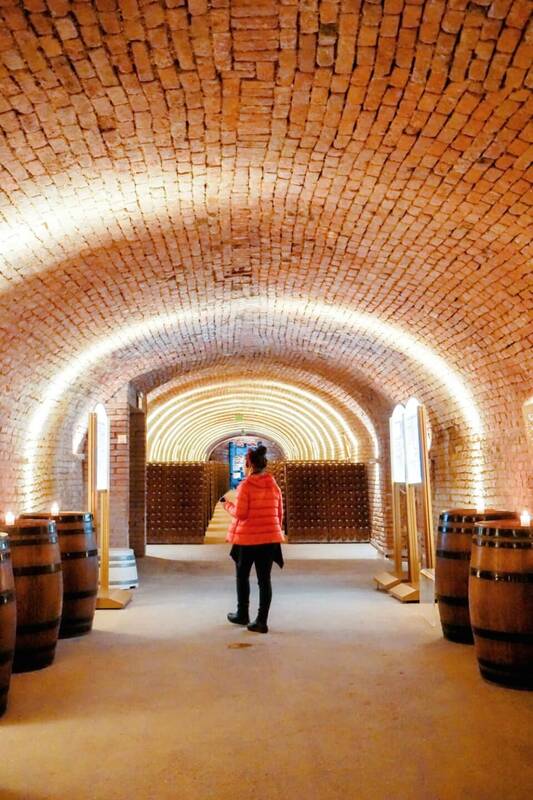 The Schlumberger Wine Cellars are actually the oldest sparkling wine cellars in Austria. You can go to Schlumberger Cellar World and take a 50-minute audio tour that guides you through the cellars and the process of making bottle-fermented wine – the production method that Schlumberger has employed since the mid-1800s. It’s the same method used in Champagne, France. When the tour ends, the drinking begins! You can sample 5 of Schlumberger’s famous sparkling wines if you opt for the Grand Tasting with Tour. Reserve wines are also available by the glass (5 EUR), and by the bottle. 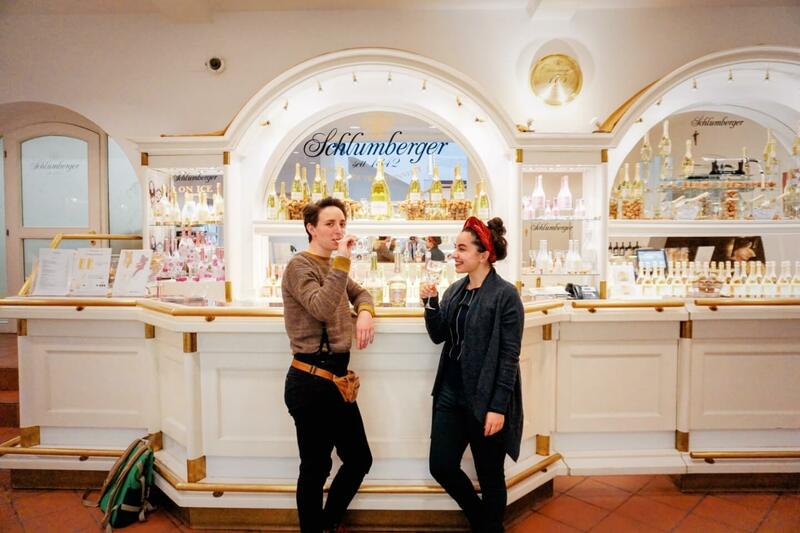 After visiting Schlumberger Cellar World, you’ll be convinced that sparkling wine isn’t just for celebratory occasions; it’s for all occasions. A Therme is a spa complex with indoor and outdoor swimming pools, steam and Finnish saunas, resting and silent rooms, cafeterias, and wellness facilities. 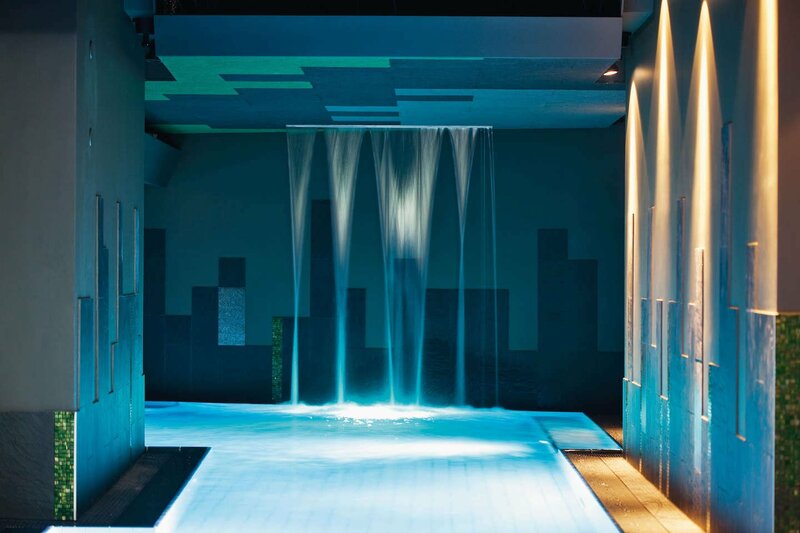 A Therme is a perfect place to unwind, read a book, get a massage and recover from a strenuous day of sightseeing. Like most Thermen spa complexes, you’ll pay an entrance fee for the main facilities (swimming zones) and an extra fee for the sauna area (adults only). The sauna is the best part -, especially for those cold January days. If you’re new to Therme culture, Therme Wien is a great place to start. There are many facilities, so you can easily spend a few hours or a full day here. Most sauna zones in Austrian Thermen are unisex and textile-free, meaning no bathing suits allowed. However, at Therme Wien, there’s a separate area for women only (Wohoo!). How to get to Therme Wien: Take subway line U1 (U-Bahn) to Oberlaa. It only takes 15 minutes to reach the Therme from the center of Vienna. When it’s cold and gloomy outside in January, there’s no better place to be than in a traditional coffee house (Kaffeehaus in German). 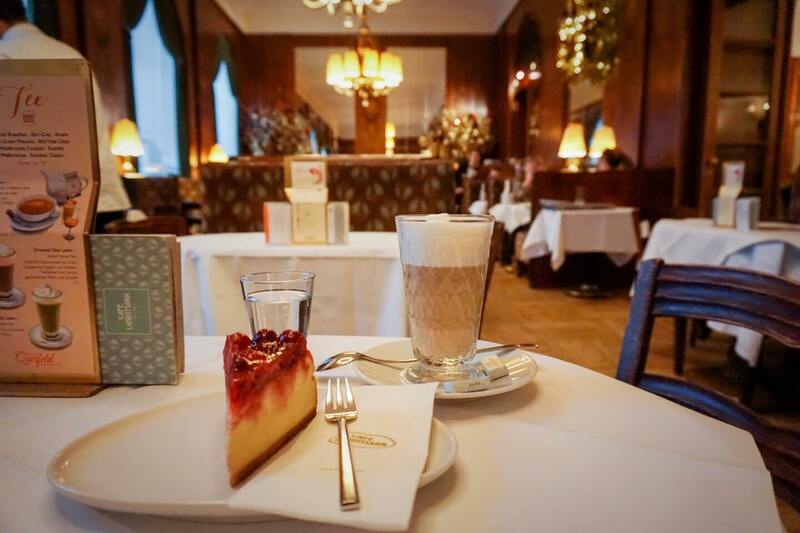 Vienna’s coffee house scene is one of a kind. You can get excellent coffee all over the world, but in Vienna, it’s all about the atmosphere. These coffee houses are considered the extended living rooms of the Viennese. You can linger all day in a Kaffeehaus with a book, or newspaper, and no one will tell you to move, pay, or buy another coffee. It’s all about slowing down and enjoying the fine art of coffee culture. Because this topic deserves its own special post, we wrote you a guide on the Best Coffee Houses in Vienna. You’ll learn how to read a Viennese coffee menu and which coffee houses to visit. 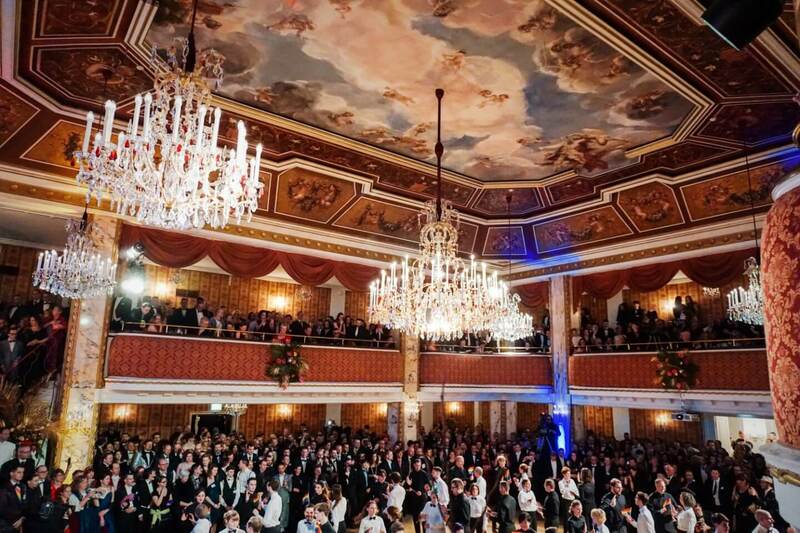 The best thing to do in Vienna in January is attending a ball … you know, the Cinderella kind. Each year, Vienna hosts over 300 balls. This is how the Viennese celebrate Fasching (Carnival). Though the season formally begins in November and ends on Ash Wednesday, January and February are “high season” for ball-goers. Each ball has a different theme, price point, dress code, etc… If you want to attend a Viennese ball, make sure you buy your tickets early, adhere to the dress code (strictly enforced), bring cash, and learn how to waltz. Want to learn more about attending a ball? 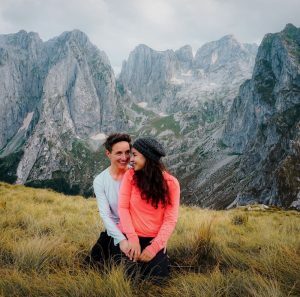 Read our post on the Vienna Rainbow Ball. Augustinerkirche (the Augustinian Church) is a parish church located at Josefsplatz, next to the Hofburg. On Sundays, you can experience the Catholic High Mass. In this type of service, almost everything is sung. We recommend attending a high mass at the Augustinian Church, because of the incredible orchestral and choral music. Each Sunday, the church choir, orchestra, and organ collectively create a sublime aural experience. It’s riveting! 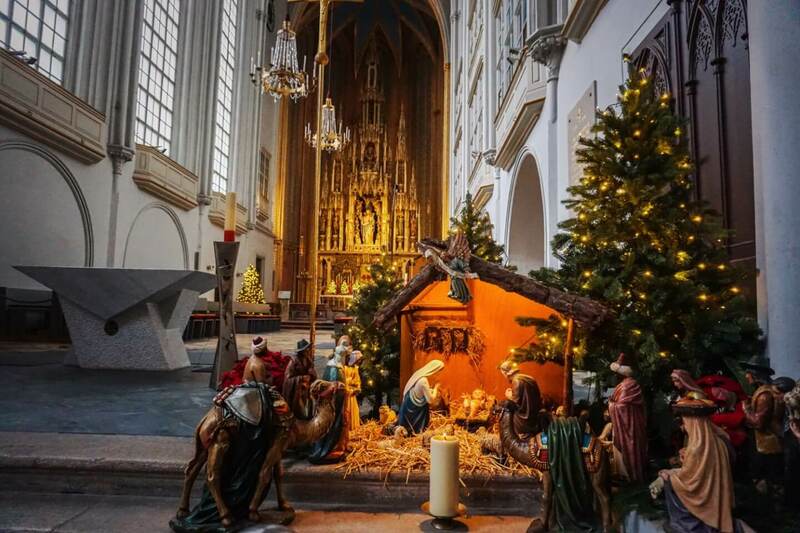 If you’re keen on Christmas and Catholic holidays, try to catch the Dreikönigshochamt (Three Kings High Mass). In Austria, Three Kings Day marks the end of the Christmas season. Time: Usually at 11:00 a.m. on Sundays (please double check). Arrive 20 minutes early to get a seat. Budget | wombat’s CITY Hostels Vienna – Naschmarkt is a clean and friendly hostel located at Naschmarkt, Vienna’s famous outdoor marketplace. This budget-friendly accommodation offers private and dormitory-style rooms. Mid-Range | Motel One Wien Westbahnhof is a top-rated and comfortable hotel located at Westbahnhof Train Station and a few minutes from Mariahilfer Straße, Vienna’s famous shopping street. When my (Sabrina) family comes to visit, they stay here. This is a perfect city break hotel, as it’s closely located to several transit options: airport bus, train lines and underground transit (U-Bahn). Luxury | 25 Hours Hotel is an imaginative and modern hotel located in the 7th district, located near Museums Quartier. Each room features a unique design, filled with vintage and modern furniture. One of our favorite haunts in Vienna is the rooftop bar located at 25 Hours Hotel.